In 2009, initial design concepts for planned improvements at the Cemetery were developed by Meisner & Associates LandVision. This document provides a framework and foundation for the Cemetery Master Plan and was widely published for essential stakeholder input. Cost $5,000. Funding for this project was provided by a grant from the Duke Energy Foundation. Photo by Tom DiBello Jr.
As a result of the collaboration with the Scripps Howard Center for Civic Engagement at Northern Kentucky University, an Archaeology class, headed by Professor Jeannine Kreinbrink, mapped and indexed all existing headstones in the Cemetery as a Service Learning Project. As part of a collaborative effort with the University of Kentucky, six areas in the Cemetery were investigated for unmarked graves using Ground Penetrating Radar. This data, along with previously published research, will provide an essential foundation for the ongoing effort to complete an accurate and comprehensive census of the Cemetery. Cost $1,100. Funding for this project was provided by a grant from Northern Kentucky University and the Cemetery’s 2009-2010 operating budget. In 2007, the Friends of Linden Grove initiated the effort to develop a Master Plan for the Cemetery. The concept of a Master Plan was originally identified as a priority in the Board of Overseers’ 2005 Annual Report. The ongoing development process will produce a Cemetery Master Plan that prioritizes needed physical improvements that can be implemented in multiple phases over a 10 to 12 year period. These improvements are an essential part of the effort to improve public awareness and appreciation of the Cemetery as an important historic and cultural asset to the City of Covington and Northern Kentucky. In 2008, a Land Use Analysis was completed by Larry Sloane Consulting Group that reviewed existing land uses and made recommendations for possible alternative uses. The report is a key component of the Master Plan document. 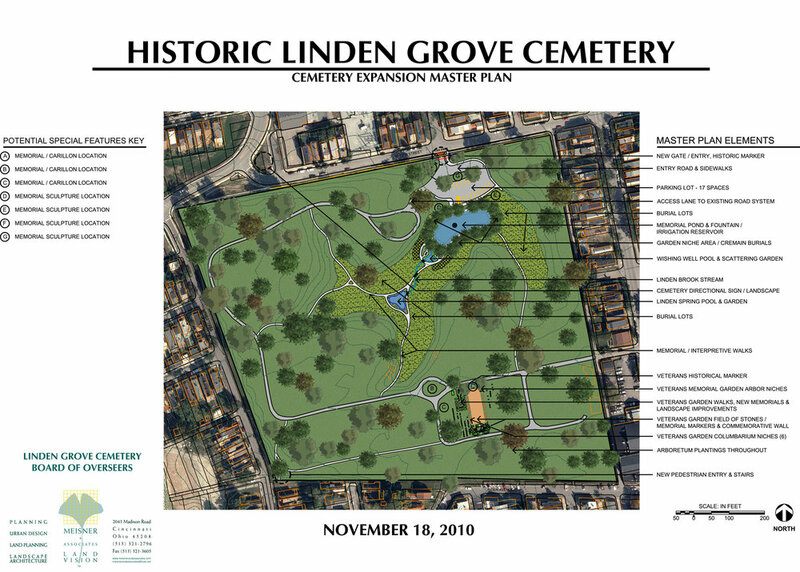 Based on the recommendations made in the Analysis, a variety of burial options, including in-ground burials, columbaria, and scattering gardens, will be provided at Linden Grove Cemetery. Cost $2,000. Funding for this project was provided by a Place Matters Grant awarded by the Center for Great Neighborhoods.